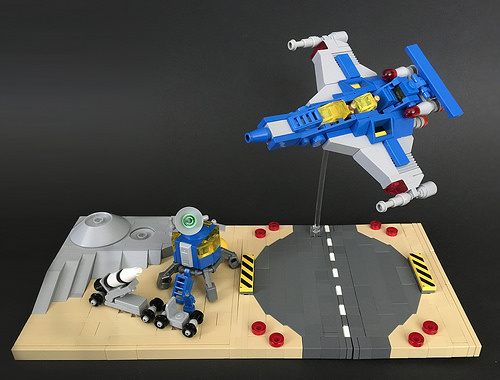 Can you feel the nostalgia oozing out of this gorgeous little trophy-scale homage to LEGO Classic Space? The diorama by Paul Lee is a perfect micro replicant of a Galaxy Explorer, Rocket Launcher and Moonbase as they would appear in a 1980s LEGO catalogue. Special attention has been paid to getting the moon craters as close as possible to the classic baseplates. This build is simple and elegant with a lovely warm after-glow of sentimentality.